My personal daily goal: 100 grains of rice (5 vocabulary words). What have you done today? Yesterday alone, 120,839,820 grains of rice were donated. Now, in the privacy of your own home, you can grow your vocabulary as you raise funds for feeding the world's poor. Each time Rotary President Wilf Wilkinson speaks, he mentions the importance of literacy. March is literacy month. What is your club doing to promote literacy? Here's a picture of President Wilf Wilkinson with Winnetka Rotary literacy chair Dr. Jeanne Beckman. Stay tuned for more Winnetka-Northfield literacy projects. March is literacy month. What has your Rotary club done to support literacy in your local and global community? No project is too large nor too small for those who are of a committed and collaborative nature. Share a book, share the world. Each Year, thousands of books are donated to schools, hundreds of university students receive international scholarships, and countless children and adults are taught how to read. Thanks to the 1.2 million members of Rotary who wrote the book on helping others." Some may ask, "What's in your wallet?" .....and what's in your heart?" Tony Kambich donated $200 to the library accessible literacy project. Rotary Literacy Project (Jeanne Beckman): Book Scanning/accessibility software - purchasing software to loan to libraries to allow people with reading challenges to access books, magazines, and the Internet. Nicaragua Matching Grant (Walter Reed):Fabretto's Children - an institution educating 700 students. Purchasing computer and digital equipment. Kenya Library (Tony Kambich): Combined Community and School Library funding materials for a new combined library. RISE International (Mike Wurzburg):Textbooks for a school in Angola. Futures for Children: Supporting a young American Indian woman to complete her high school education. Applications have already been submitted for funding for 2008. Stay tuned for updates on these and other literacy projects. To kick off literacy month (March) and celebrate Dr. Seuss' birthday, Winnetka Rotarian Dr. Jeanne Beckman held a Dr. Seuss birthday party at The Book Stall in Winnetka. In addition to reading books "the old fashioned way," children (and adults) who came to the party had an opportunity to try accessible reading software by reading a Dr. Seuss book on the computer. 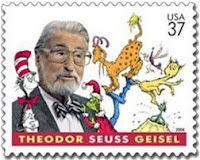 What is your favorite Seuss book? I think mine is Green Eggs and Ham, the Number four all time rank of children's hardcover books. Stay tuned for more literacy events during the month of March.